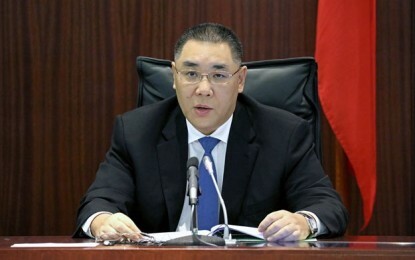 A unit of Hong Kong-listed casino services firm Macau Legend Development Ltd says it will accept a reduction of one-third in the previously-proposed height for a waterfront hotel the group plans to build. It had wanted the Legendale Hotel – due to be at Macau Fisherman’s Wharf on the city’s peninsula (pictured) and next door to Sands Macao (pictured right), a property of Sands China Ltd – to be 90 metres (295 feet) high. Now the group accepts it can be no higher than 60 metres, said on Monday Melinda Chan Mei Yi, president of Macau Fisherman’s Wharf International Investment Ltd, and wife of Macau Legend group co-chairman and chief executive David Chow Kam Fai. Ms Chan stated on the sidelines of a media lunch on Monday: “We’ve previously seen media reports and public discussion over the height of this project – on whether it should be restricted at 60 metres [above ground] or 90 metres… Now that as I’m presiding over this company, I’ll target the hotel to be constructed at the height of 60 metres when we are to resubmit the bid.” She said resubmission to the Macau government was likely to occur soon. Macau Legend mentioned in its 2017 interim results filed in August that the plan for Legendale Hotel was undergoing redesign “to meet the height requirements of the relevant government authority in Macau”. GGRAsia understands that the capping on height is a requirement of the Macau government in response to public opinion on the issue, rather than a statutory or regulatory requirement. Had a 90-metre height been allowed, it would have largely obscured the sight of Sands Macao when viewed from across the waterfront. “My view is that setting the height as 60 metres should be adequate,” Ms Chan stated on Monday. “In order to relieve people’s concerns over how the project affects the city’s vista, I’ll say let’s keep the height as 60 metres for the project and apply for it,” she added. Ms Chan was a Macau legislator up to October 2017. Ms Chan also expressed hope that the Legendale Hotel would be allowed to house gaming facilities, as Macau Legend had indicated in previous company filings. 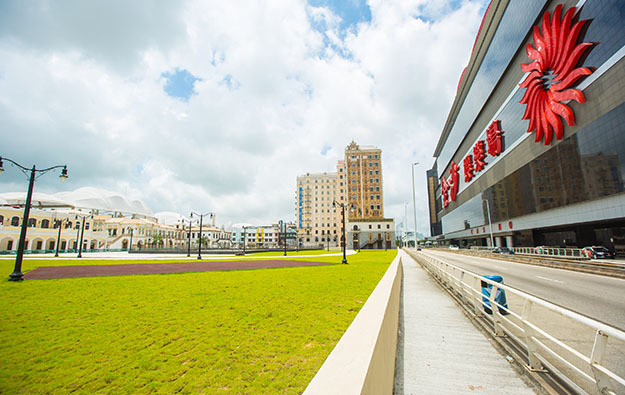 “Gaming… is after all, the foundation for Macau Fisherman’s Wharf… we have that at the Babylon Casino and Legend Palace,” said Ms Chan, referring to existing casino facilities on that site. “Of course I hope to see this [gaming] to be featured there,” she added, referring to the Legendale Hotel. Macau Fisherman’s Wharf, a site located near the Outer Harbour Ferry Terminal on Macau peninsula, launched to the public in 2006 and is promoted by the Macau Legend group. Early on in its development, the site opened a hotel without a casino – the Rocks Hotel – and a gaming facility without hotel – Babylon Casino. Since then, the open-air site has undergone extensive remodelling, including an all-weather canopy for part of its main avenue. Macau Legend has so far completed two out of three new hotels planned for a revamp of the site: the Harbourview Hotel, which opened in February 2015 and does not have a casino, and the casino hotel Legend Palace, which opened in February 2017. Ms Chan said currently her company is working on ways to attract more visitors to Macau Fisherman’s Wharf by increasing the frequency of events there and improving the shopping available there. “Previously we started a night market scheme here and in the coming 12 months, we expect that we can host at least one event every two months, so that we can see increased footfall,” Ms Chan stated. “We’ve taken back some shop spaces, and we’ll re-lease them to new tenants in the hope of bringing out some new [retail] concepts,” she added, noting that the group had been in talks with some retail and food and beverage brands about setting up operations at Macau Fisherman’s Wharf, including a franchise specialising in Chinese spicy hotpot dishes and the local fruit shop and juice franchise “Kuok Kei”.